1. I joined as a Process Expert account Manager on June 2012 till April 2015 for US Collection 2. Promoted as Resident expert Account Manager since April 2015 till February 2018. Worked for the billing department and customer service for the Auto Insurance. I have handle for processing payment over the phone and sending request for claim follow up and Renewal of the Insurance etc..
1. Joined as Sales Executive from November 2006 till June 2007 2. 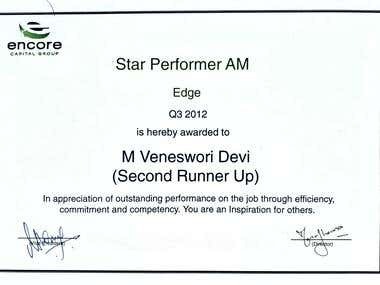 Promoted as Quality Verifier on July 2007 till December 2008. As a quality verifier I observed and listen to all sales calls to check if the agent have given all the required quality parameter to the customer. If any misleading information given then we reject the sales.